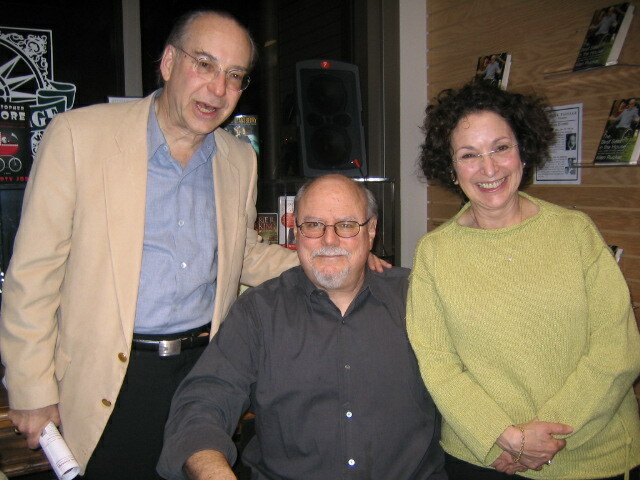 Snaps from on the road: Sarah's parents come out for a signing at Book Passage in the Ferry Building. Snaps from on the road: big crowd at Davis-Kidd Books in Nashville. 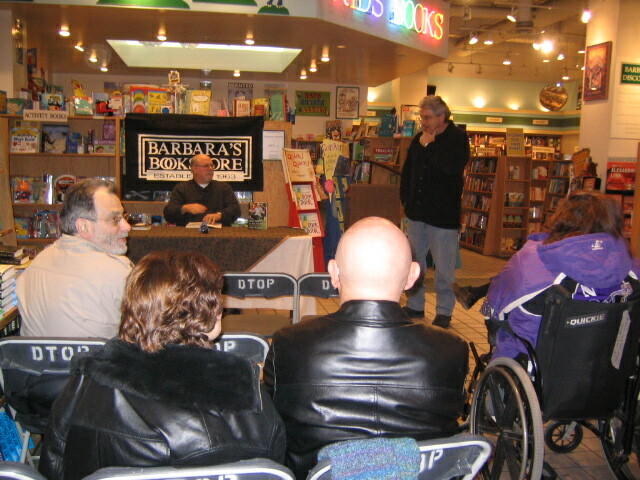 Snaps from on the road: Harold Ramis introduces me at Barbara's Books in Oak Park, Ill. I'm sure you are, just waiting for the next posting. Here it is: Back from San Francisco, Chicago, and Nashville on world book tour and headed next week to Oklahoma City for another book event on Saturday, March 3, at Full Circle Books at 3 pm. If you are in the vicinity, please drop by. Say you read about the event on this blog and I'll give you a big kiss. Also, for you NPR lovers, I'll be on the NPR show, "Talk of the Nation," live on Wednesday, 2/28, at 3 pm EST. Finally, if you want to read the best write-up of the book so far, go to http://www.tvweek.com/article.cms?articleId=31541. 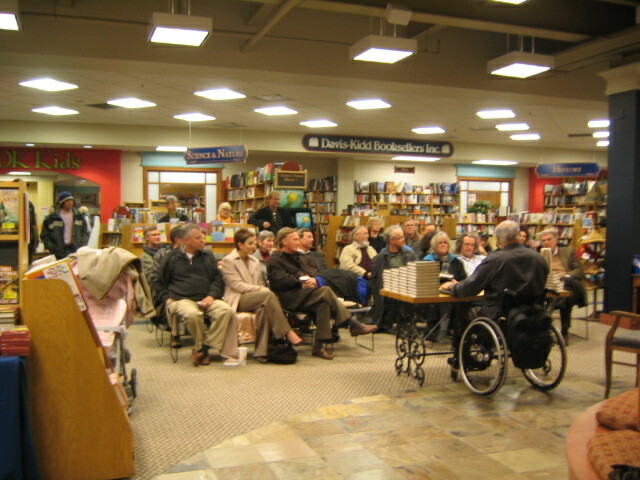 I get great, great letters about the book from all kinds of wonderful people, ambulatory and seated. This morning I heard from an ex-New York State trooper, Paul Richter, who was shot on the job in 1973 and is a major force in promoting spinal cord injury research in the state of New York. He calls himself "an old fart" but has more energy than a hundred young ones. I can't wait to meet him in person. I also heard from Larry Throne from Ada, Oklahoma, a fellow TM'er, who plans to drop by the book event on 3/3. With their permission, I am going to start publishing some of these letters right here. Stay tuned. Nashville, by the way, is one of American's primo cities. Right size, right people, great food. And when you are in town, drop by the Davis-Kidd Bookstore. It's first class. See you in OKC on 3/3. First off, kudos to Caroline Tigeress, the first person to post on allenrucker.com. Caroline heard an interview on KBOO-FM in Vancouver, Washington. Thank you Paul Van Dyck and "The Sounds of Awareness". For all lovers of personal narrative writing. A terrific on-line magazine devoted to such writing -- SMITH mag/Memoirville -- did the best interview I've done so far about "Best Seat" and the process of writing it. I recommend that all check out the mag at www.smithmag.net. It's a beautiful thing. Great signing at Book Passage in the Ferry Bldg in San Francisco last Wednesday. Great location, great crowd. Thanks, Ron, for a wonderful evening. And thank you Sarah's parents for dropping by. I'll be posting pictures soon! I'll be in Chicago on Monday night, Feb 5th, in the freezing cold, at BARBARA'S BOOKSTORE in Oak Park at 7:30 pm. Please come by to warm up. Next stop: Nashville, Friday, Feb 9th, at DAVIS-KIDD BOOKSTORE at 6 pm. Nashville is one of my favorite places on earth. I'll also be speaking and showing films at Vanderbilt from the 7th through the 9th, so if you are a Vanderbilt student, look around for the posters.